Watch Sky TV, English TV and Freesat TV in Spain. Installed by British, bilingual Satellite Engineers. 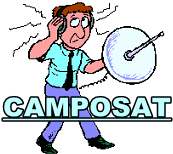 Call Camposat today on +34 639 501 288 for a FREE no obligation quotation. We have provided a Sky TV and Freesat TV installation service in Southern Spain for over 20 years, fitting and maintaining Sky TV and other television systems in private villas, bars and restaurants. Almost all our work comes to us by customer referrals. Plus all our engineers speak both English and Spanish fluently. Agree a time and date for one of our Satellite Engineers to install your system. Enjoy all your British TV channels in Spain, like you did in the UK. All of the Costa Del Sol, Costa Tropical, from Gibraltar - Motril. Inland - Alhaurin, Alora, Antequera, Archidona, Campillos, Cartama, Casares, Coin, Colmenar, Competa, Frigiliana, Gaucin, Mollina, Ronda, Velez-Malaga, Viñuela, Yunquera. Alcala La Real, Almuñecar, Costa Tropical, Granada Capital, Guadix, Lanjaron, Loja, Montefrio, Motril. Alcaudete, Andujar, Jaen Capital, Martos. Baena, Cordoba Capital, Lucena, Montoro, Priego De Cordoba, Puente Genil, Rute. Ecija, Estepa, Marchena, Osuna, Pruna, Seville Capital. Algeciras, Arcos De La Frontera, Barbate, Cadiz Capital, Chiclana De La Frontera, Costa De La Luz, Jerez De La Frontera, La Linea De La Concepcion, Olvera, San Roque, Sotogrande, Tarifa. This website and its content is copyright © Camposat 2012.. Picture Window theme. Powered by Blogger.